I spotted the book Raindrops Roll by April Pulley Sayre on a display and I was inspired to create a rain-themed storytime this summer. I did it during our last week of summer storytimes and this was a really fun one to go out on because I tried a new thing and it worked (yay!). Intro: Okay, I was going to bring out our rainstick to show the kids so we could hear it and I could talk about how they are made. BUT I couldn't find it on the hectic morning of our storytime, so I skipped that. If you have a rainstick, it would be a fun thing to show the kids. 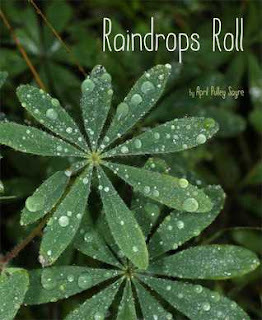 Book: Raindrops Roll by April Pulley Sayre (Bean Lane Books, 2015). I was drawn to this one for its photo illustrations, which are a little unusual in children's picture books and I think they're neat. This is a great book for introducing kids to new vocabulary because Sayre uses such a rich selection of different words. This simple rhyme helps kids practice counting down and you could use it to practice colors, too. I put it in here to break up my books a little bit and give them something a little bit active (they can count on their fingers as I go through the felt pieces on the board). You can use the names of the kids in your storytime or substitute Mom, Dad, Cousin, etc. or just say "Someone". Book: Storm Song by Nancy Viau (Amazon, 2013). We talked about what happens when a storm comes - what do we see, what do we hear? And one kiddo mentioned that it's sometimes scary, which lead right into this book. 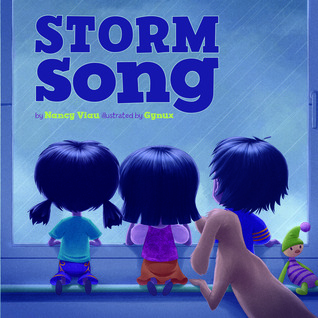 A storm comes and the power goes out and this family observes the storm and finds things to do with the lights out. It's a book that depicts something that most kids are familiar with and it has a lot of interesting rhythm and sounds in the text. If it's raining outside, wear your boots. If it's raining outside, then your boots will keep you dry! Repeat: raincoat, hat, umbrella, etc. I asked the kids to tell me what we need to wear if we go outside when it rains, so feel free to turn this over to the kids and use their suggestions in your song! Doing action songs in storytime not only helps get some wiggles out and allows kids to then sit and listen more calmly, but singing songs helps kids hear that words are made up of smaller sounds. Book: Mr. Gumpy's Motor Car by John Burningham (HarperCollins, 1976). 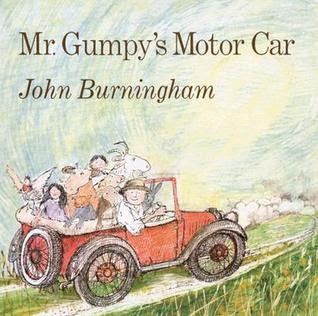 It's a sunny day and Mr. Gumpy is going for a drive. All of the farm animals want to come, but none of them want to help push when it rains and the car gets stuck in the mud. 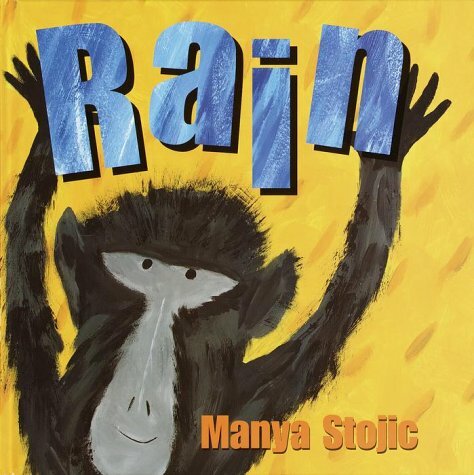 Book with Props: Rain by Manya Stojic (Crown Books for Young Readers, 2000). I chose this book because I wanted to use some props with it (this was the new thing I tried!). As a rainstorm starts on the Savannah, animals see lightning, hear thunder, and finally the rain comes down. I divided my group up into three smaller groups based on where they were sitting. 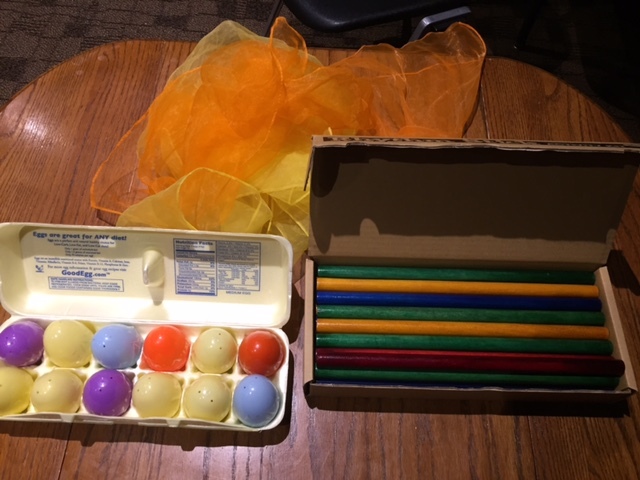 The kids on the right got yellow and orange scarves for lightning, the kids in the middle got egg shakers for rain sounds, and the kids on the left got rhythm sticks for thunder. First, we each practiced our parts. The lightning kids waved their scarves in the air up and down like lightning striking. The rain makers shook their eggs. And the thunder beat their rhythm sticks on the floor. Then as I read the book, each group chimed in when it came to their part in the story. I didn't read the whole book - after the rain came and then the rain stopped, I skipped to the end where it gets hot again. The kids had a lot of fun with this and even though I was nervous of chaos with so many noise-making props, it turned out to be really fun. I like finding ways to get kids involved with the story in unusual ways! And in this activity kids practiced motor skills and following directions.